ConceptDraw DIAGRAM has a design set of the vector stencils, examples, and templates for drawing different types of a diagrams. Audio and Video Connectors solution as part а this software includes sockets and plugs professional-looking vector stencils and several samples. One can make own audio and video connections hookup diagram. Sample 1. Hookup drawing - Home entertainment system with surround sound. 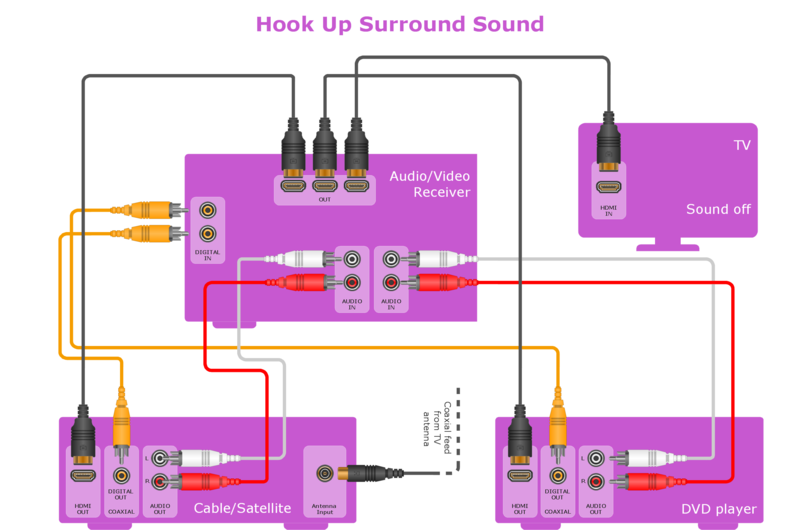 This example hook-up diagram was created using the ConceptDraw DIAGRAM diagramming software extended with Audio and Video Connectors Solution. Use ConceptDraw DIAGRAM with vector stencils of jacks, plugs and silhouettes of audio and video devices from Audio and Video Connectors Solution to illustrate connections of your entertainment system.